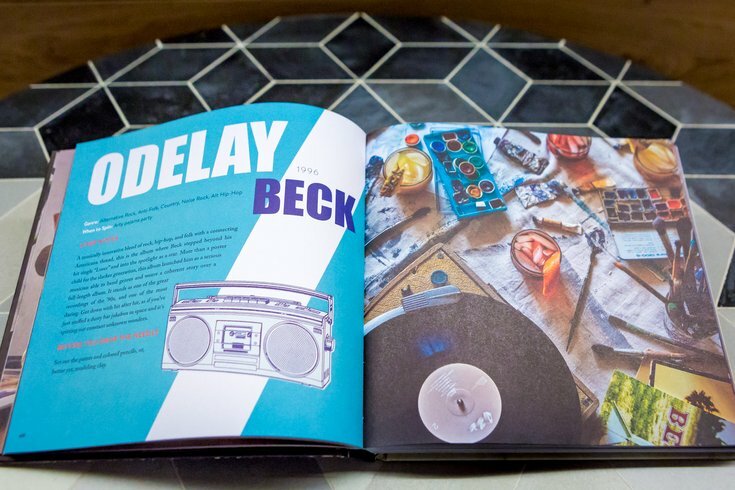 The Beck section in the new book 'Booze and Vinyl' by André Darlington and Tanaya Darlington. A few days before Record Store Day, there will be a special event at WHYY mixing cocktails and iconic records. Siblings André and Tenaya Darlington are throwing a listening party Wednesday, April 18, to promote their new book Booze and Vinyl: A Spirited Guide to Great Music & Mixed Drinks. The Darlingtons chose 70 albums and organized them into four chapters within the book: Rock, Dance, Chill and Seduce. For every album, the siblings created a Side A and Side B cocktail. "Sometimes, the pairings follow an album's entire mood. In other instances, they follow a particular song, such as the Bohemian Cocktail for Queen's 'Bohemian Rhapsody,'" shared André. Among the featured albums are "Sgt. Pepper's Lonely Hearts Club," "Born to Run," "Like a Virgin," "Thriller" and "Back to Black." At the party, the siblings will discuss their new book – the third they've written together – with Marty Moss-Coane from WHYY's "Radio Times." Attendees will be treated to some of the cocktails featured in the book, and there will be beer and light bites, too. Plus, partygoers can listen to records in the Crosley Turntables van, which will be outfitted with record players, couches and a jukebox. Tickets to the event are $60 per person and include all food and drink, as well as a year-long WHYY membership. Books will be available for purchase. Can't make it but interested in Booze and Vinyl? On Thursday, April 19, there will be a book signing at Art in the Age from 6 to 8 p.m. The van will also be parked outside for guests to explore. Then, on Record Store Day (Saturday, April 21) there will be a special happy hour at Martha. From 4 to 7 p.m., buy a book, or bring one to get signed, and receive a free drink.